Exercise & Hormones: What’s Going On? To make matters more confusing, the claims above are both simultaneously true and false. It all depends on the context of the research. For example, one study found that exercise may slightly increase free testosterone levels, but only if testosterone levels are measured directly after completing a workout, and only if the exercise is anaerobic (70-90% maximum heart rate efforts). In fact, that same study also found that in most cases, free and total testosterone levels decline below baseline an hour after working out (though the decline was statistically insignificant). Likewise, another study found that endurance athletes, on average, have lower baseline testosterone levels than sedentary people. If you’re trying to maintain hormonal balance, promote thyroid functionality, and minimize systemic inflammation, how does exercise fit into the picture? Want my full guide on exercise? Enter your email. I'll send you my 25-page guide on exercise and hair loss. You'll also get my recommendations on which exercises hurt our hormones, which don't, and which you should focus on to keep your health (and hair). Is Hormonal Balance Possible With Exercise? To recap from an earlier article, both men and women with hair loss tend to have imbalanced testosterone:estrogen ratios. In order to mitigate the conditions that precipitate hair loss (like systemic inflammation and poor thyroid function), you need these hormones to be properly balanced. For men in first-world countries– who (through diet, lifestyle, and lack of sleep) – often suffer from suppressed testosterone levels, this usually means either 1) increasing testosterone levels, or 2) decreasing estrogen levels. This article’s focus is going to be about exercise and its connection to testosterone, human growth hormone, and cortisol. Specifically, the focus is on what to AVOID if your goals are to maintain hormonal balance, and thereby promote a healthy environment for your hair. Exercise is a very broad term, and more narrowly defining it will help you understand exactly how certain types of exercise affect your hormones. Intensity – is it anaerobic or aerobic? Duration – how long does the exercise last? Frequency – how often is the exercise repeated? Were hormones measured seconds, minutes, hours, or days after exercise? Did hormones change depending on the time of measurement? Did baseline hormone levels change after exercise for the long-run? Fitness levels – were the study’s participants trained athletes, or sedentary people? As you can see, there are a lot of things to consider. And because research on hormones and exercise isn’t standardized (meaning scientists don’t control for the same variables across all studies), it’s difficult to make accurate cross-comparisons. With so much conflicting data, how can you sift through the research and make informed decisions about how to incorporate exercise into your life? For men and women who want to begin reversing hair loss, you want to start by rebalancing your testosterone:estrogen levels. Remember how excessive chronic anaerobic exercise can actually lead to arterial calcification, heart palpitations, and systemic inflammation? Chronic endurance exercise can also negatively impact baseline testosterone levels. In a study of distance runners involved in endurance training for 1-15 years, baseline testosterone levels were 60-85% of their sedentary counterparts. This would indicate that endurance seems to suppress testosterone levels in athletes. Interestingly, power lifting (short duration, explosive exercises) seems to elicit a brief (but insignificant) testosterone uptick, suggesting that intense anaerobic exercise for very short periods may temporarily raise testosterone levels. Unfortunately, in the study cited, hormone levels were not measured beyond 5-minutes post-workout, so we don’t know if there was an increase on baseline (resting) testosterone. Based on the other studies, my best guess is it either negatively impacts testosterone levels or has no effect in the long-run. If Exercise Inhibits Testosterone Production, Should I Exercise At All? You should absolutely exercise. Exercise is a critical component of healthy living, hormonal balance, and longevity. While there’s evidence to suggest that excessive exercise may not be beneficial to testosterone levels, the right kind of exercise can be very beneficial for a myriad of other reasons. One reason to exercise is to increase the stimulation of human growth hormone, or hGH. Human growth hormone, or hGH, has a plethora of responsibilities in the human body. To name a few, hGH plays a significant role in growth and development, the turnover of muscle, bone, and collagen, and other metabolic regulations like fat metabolism and body composition. Proper regulation of hGH is integral for immune support and hormonal balance. Unfortunately, our bodies produce less hGH as we age. Since human growth hormone is so crucial to cognitive function, effective sleep, and therefore hormonal balance, it’s in our best interest to keep levels as naturally high as possible. The two most potent ways to naturally boost your hGH secretion are through sleep and exercise. In fact, certain types of exercise – including anaerobic training for a minimum of 10 minutes – has been shown to maximize hGH secretion at rest over a 24-hour period. Surprisingly, long-term endurance training can actually lower resting levels of hGH. What gives? Once again, it’s all about balance. Too much exercise – either aerobic or anaerobic – can reduce testosterone levels and hGH secretion. With that said, some anaerobic exercise seems to temporarily increase testosterone, as well as resting hGH levels over a 24-hour period, without negatively impacting either hormone in the long-run. So, in order to optimize your hormonal balance, you need to exercise, but NOT excessively. Why does testosterone and hGH decrease when you do too much exercise? The answer has to do with your adrenal glands and cortisol. Dr. Doug McGuff is an author, medical practitioner, and personal trainer who has studied exercise physiology, the adrenal system, and insulin sensitivity for decades. He’s an avid exerciser who builds his training regimens based on personal data and scientific research. In his two-hour interview with Dr. Mercola (which is worth your full attention), he discusses the relationship between exercise, cortisol, and hGH secretion. As you begin an exercise regimen, you’re not as in-shape and your efforts during each workout feel harder and more draining. However, as you continue an exercise regimen, you adapt and become stronger and more metabolically efficient. Your conditioning allows you to perform the same amount of exercise for what feels like less expenditure. In a sense, you’re getting in shape. After you’re in shape, there’s a desire to push yourself to the same pain thresholds you experienced before becoming in shape. For the same effort, you might be capable of producing two to three times more mechanical and metabolic effort than before you began exercising. Your body also feels like it recovers more quickly. However, while the body’s pain threshold and metabolism may adjust to these new effort levels, your fast-twitch muscles (the ones leveraged in anaerobic training) don’t. These muscles still require a minimum of 48 hours for recovery. Paradoxically, your body feels recovered well before the 48-hour mark, and so you develop a desire to perform another hard training session sooner. What happens? Your body hasn’t fully recovered. When you repeat hard training without full recovery, you no longer promote that same hGH spurt you experienced when you first started working out. Instead, you tax your adrenal system. Your adrenal system is organized in layers, and depending on exercise frequency and intensity, your body taps into the appropriate layer. Without allowing your body to properly recover, you don’t tap into the innermost layer to increase hGH. Instead, you increase cortisol – the antagonist of testosterone. If you tax your body too often without adequate recovery, your body no longer responds with an increase in hGH. Instead, you produce cortisol – the antagonist of testosterone – thereby undermining the entire benefit of controlled anaerobic exercise in the first place. This is the critical endpoint to everything discussed above. It explains why endurance athletes often show lower resting testosterone levels, and why chronic cardio can often induce lower resting testosterone and hGH levels. 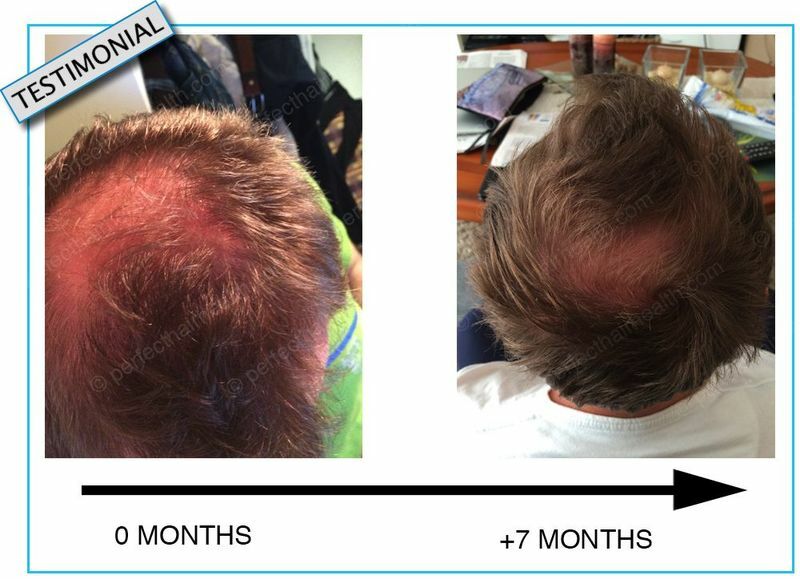 By overtaxing the body without adequate recovery, your body begins secreting more cortisol, which suppresses testosterone production and generates the hormonal imbalances that are often associated with hair loss. The lesson? Don’t overdo it. Train smart. Focus on doing the minimal amount of work that yields the maximum output of results. Because research on hormones and exercise isn’t standardized, and because of the variability of definitions and controls across studies, it’s difficult to draw firm conclusions regarding the role of exercise and the hormonal changes in the body. However, with the research available, endurance exercise and frequent anaerobic exercise appear to decrease testosterone and human growth hormone production. This can yield unintended consequences – like chronic fatigue, suppressed endocrine function, hair loss, and hormonal imbalances. Certain exercises – like sprints and heavy weight lifting – seem to promote short-term testosterone production. However, the effects on baseline testosterone levels are negligible, unknown, or negative in the long-run. Chronic anaerobic exercise can also prompt an increase cortisol production, whereas repeated anaerobic exercise with adequate recovery prompts an increase in human growth hormone. You just have to be smart about it. In the third installment of this series, I discuss my exercise regimen. To give you a hint, it’s not very complicated. I don’t have a gym membership, and I don’t exercise intensely everyday. I focus on the biggest payouts for the least amount of effort, and thereby promote a healthy hormonal balance and endocrine system. Want More Research On Exercise, Stress, Hormones, And Health? Perhaps the most comprehensive effort to summarize the research on health, hormones, and exercise has been Armi Legge’s six-part series on all-things endurance related. If you’re interested in exercise, cardiac stress, free radicals, and hormone levels, be sure to check out his series here. This is part 2 of 3 of the article series on hair loss and exercise. The final article explains how to exercise properly to promote muscle growth, hormonal balance, optimize endocrine function, hair growth, and well-being. hi rob I purchased the ebook a while ago…im still on minoxidil…am I going to shed if I stop taking it? Hey Wesley — in most cases, yes. I certainly shed when I stopped taking Rogaine after 7 years. It’s part of the downside of most of these drugs — once you stop taking them, you lose what you gained. It’s the problem with most of Western medicine. You manage the symptoms of a condition, rather than treating the condition itself. Love your work. Helps add confirmation to suspicions I’ve had for a long time. Helping me deal with people who look down their noses and label me as “just weak” or “full of excuses” when i dare suggest a negative effect of overtraining and not resting enough..
Hello! How can i get the e book? I am 32, my hair are thinning, balding in some areas, no result with drug lotions (only temporary). Please help…? All the articles very helpful. I have abandoned shampoo already..
Hey Dimitris – the book will be available tomorrow (Tuesday) on the front page of the site! Hi Rob, thanks for putting this together. Just wanted a bit more clarity on my own routine. I go to the gym 5 days a week, doing weight training. I always have at least 48 hours rest in between the muscle groups I train. The sessions last no more than 45 minutes with 15 minutes attributed to rest. My reps sit in between the 8-12 mark for 3 sets. This sounds totally fine. In general, weightlifting (and even general working out) isn’t too problematic. You’re probably tapping into your anaerobic system since these rep ranges qualify more as “bursts” or “sprints” than endurance. But it’s likely you’re not staying pegged in the anaerobic system for long, given your rest periods.